The Fillmore has been a few blocks from my home in Silver Spring, Maryland for a while now, but the place has never featured any concerts I've wanted to see. That's pretty amazing, especially if you know about the expansiveness of my music collection. But I think Jeff the Brotherhood has one of the best releases of the year, and they rolled into the Fillmore Saturday night with another group that has a few albums in my collection, Delta Spirit (and their arguably better side project Middle Brother). So Rachel, Lori, and I decided to go. Further, the show was reasonably priced at $22 per ticket (check), it was great to finally get to see what turned out to be a pretty decent venue (check), and I was psyched about Jeff the Brotherhood (check). 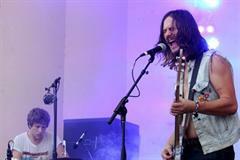 The band is a duo from Nashville, who play what I would call laid-back stoner rock, with basic but enjoyable lyrics. The whole thing borders on a punkier version of Weezer. 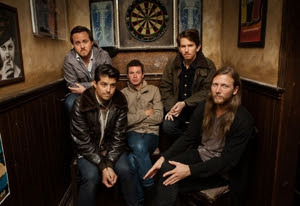 Then came headliners Delta Spirit, which has a "whole thing" as well. That whole thing equated in the three of us walking out five songs in. Everything was just wrong about this band. Its performance style just didn't add up, even though the cult-following looks on the audience's faces appeared to be approving enough. They began with a pretentious light show and some sort of piped-in music designed to build the drama before they honored us with their stage entrance (a stark contrast to Jeff the Brotherhood, which set up its own instruments and ran a sound check before their set, all the while with their butts hanging out like plumbers). Delta Spirit, from San Diego, entered the stage like they were U2 and proceeded to immediately creep my group out. With an Uncle Jesse (John Stamos) from Full House lookalike on vocals wasting no time in encouraging the crowd to lift our hands and clap along, the band proceeded to sound nothing like the mildly pleasurable alt-country of their albums. They had a hippie on bass and a spazzy Radiohead-wannabe on lead guitar. The singer screamed a lot, lacking any sense of likableness or bluesy-ness (which I think they were going for), and sent us away a little disgruntled from our first Fillmore experience.